Worker availability and satisfaction provide the base efficiency value. Experts grant bonuses to that value for Production Lines in their field of expertise. Finally, soil fertility (or lack thereof) provides another bonus (or detraction) to the efficiency of certain Production Lines. Note: All Production Lines employ workers even when no orders are queued or production is halted. Idle workers cannot be moved from one building to another. Each type of worker has their own needs that need to be fulfilled in order to keep efficiency up. 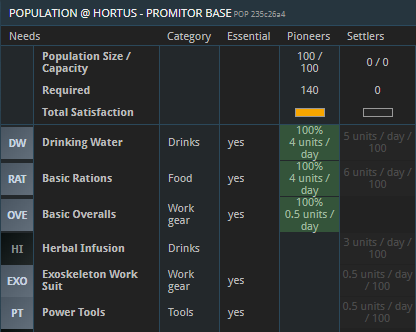 Worker needs can be looked up in a base’s Population window. For example, Pioneers need 4 DW, 4 RAT, and 0.5 OVE per day to be fully satisfied, and Settlers need 5 DW, 6 RAT, 3 HI, 0.5 EXO, and 0.5 PT. Efficiency stays at 100% if both luxury and non-luxury needs are met. A workforce will keep working for as long as at least one of those resources is still at their disposal. Only once all of them run out, production will stop. If only part of the required resources is available, the workforce’s satisfaction decreases and hence its productivity suffers. The first full amount of any consumable required for the following 24 hours (e.g. 4 RAT for 100 Pioneers) is claimed by a base’s population (and thus disappears from the inventory) as soon as the commodity becomes available in the base’s inventory. The same happens again 24 hours later, again and again until the consumable is used up. This goes for each type of consumable individually: If a population starts consuming DW at 12 PM and RAT at 4 PM, the next batch of DW will be used up at 12 PM the next day, and the next batch of RAT will be used up at 4 PM the next day. Note: No production needs to be running for a population to be consuming resources! 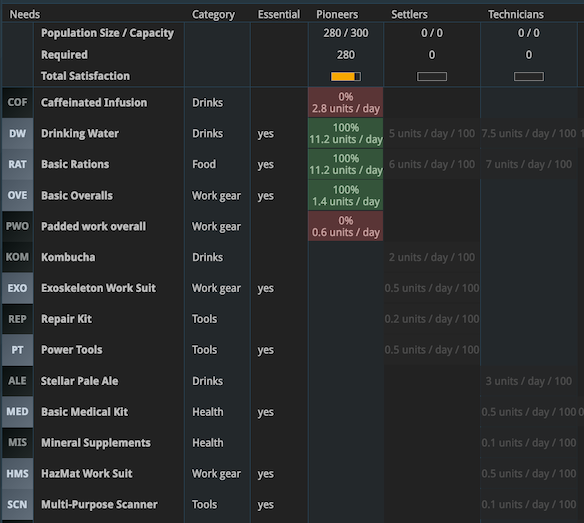 Idle workforces have the exact same needs as active ones and will still use up consumables in the base’s inventory. All buildings can be granted bonuses by so-called experts. 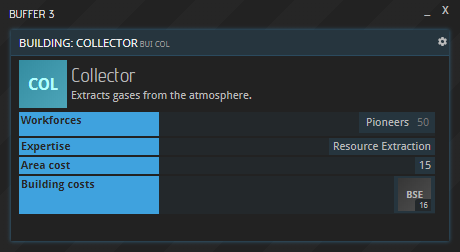 You can see your experts by pressing the EXPERTS button in your base. To utilize them, hit ACT (Activate); to remove their bonus, hit RMV (Remove). The first experts of any company are included in its starter package, but all following experts will appear over time. Keeping a Production Line running will eventually create a new expert in its field, e.g. producing goods with a Farmstead will generate Agriculture experts over time. 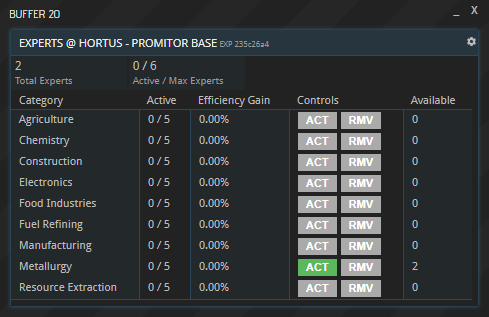 After a total of 5 experts is reached, new experts will still be created, however no more than 5 at a time can be active. The days indicated above relate to a single building. Operating two buildings in the same industry, i.e. within the same Expertise category, will cut the required time in half, operating three will bring it down to a third etc. This also happens when both buildings are part of the same Production Line, e.g. two (three, four, five…) Farmsteads will bring the time down equally. The bonus granted by an expert is a fixed value which is simply added to the workforce’s efficiency. For example, a workforce operating at 90% efficiency will operate at 102.48% efficiency once 3 experts are activated at the base. The efficiency of certain buildings is impacted by a planet’s soil fertility. If this is the case, it will be indicated next to the building’s entry in the BSC window. The buildings currently requiring fertile soil are Farmstead (FRM) and Orchard (ORC). 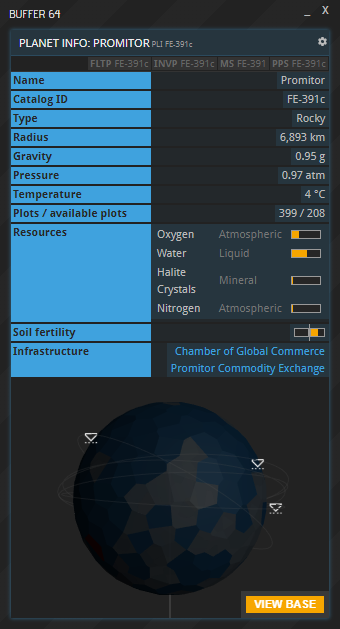 A planet’s soil fertility can be seen in its PLI window. The further the yellow bit of the bar reaches to the right, the more fertile it is; the further it reaches to the left, the lower the fertility value. Note: If there are two dashes instead of a bar, the planet is infertile, meaning that buildings impacted by soil fertility cannot operate at all here. Neutral fertility (i.e. no yellow) indicates a modifier of +0%. Poor fertility (yellow left of the center) is a negative modifier, while high fertility (yellow right of the center) is a positive modifier. The further the yellow bar reaches respectively, the bigger its impact, with a maximum range of roughly -33% to +33%. The Chamber of Global Commerce, if existent on a planet and active, can provide a temporary bonus to productivity. As is the case with experts, the respective percentage is simply added on top. For example, the CoGC program Education Events: Pioneers provdes a 10 % bonus to all pioneer-operated buildings as long as it is active, and the program Advertising Campaign: Agriculture grants a 25 % bonus to all facilities in the agriculture sector.